One of the most common questions I hear from patients is “do I need bunion surgery?”. The question I ask back is, “do you have pain on a daily basis, does the bunion limit your activities and are you having a hard time fitting in shoe gear?” Bunions are a progressive deformity that increase in size and can begin to affect the other toes. 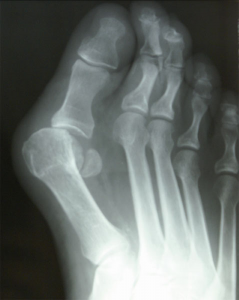 Bunions cannot be reversed with any amount of stretching or splinting and can only be fixed surgically. The surgical procedures depends on multiple factors including; the size of the bunion, activity levels, bone quality and overall foot structure. With proper procedure selection bunion surgery is highly successful and patients are extremely satisfied. The average procedure can take between 45 minutes to about 2 hours, sometimes a little longer if other toes are involved or other soft tissue structures need work. One of the best parts of our practice is we typically perform 2-3 bunions every Monday and have an onsite surgery center. We have intravenous sedation that we provide to make the overall experience comfortable and stress free. Our protocols for recovery decrease down time and speed recovery. Give us a call at 425-391-8666 or make an appointment online for a consultation.